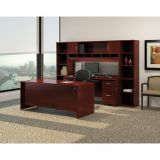 Bush Business Furniture Series C: Mahogany 72W Credenza - Desk Shell - Featuring a sturdy design and classic looks, the Bush Business Furniture Series C 72W x 24D Desk gives you the workspace you need with loads of options for expansion. 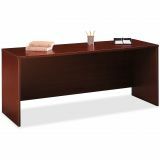 Set up this commercial office furniture as a standalone Desk or Credenza, or use it as a Return to form an L Shaped or U Shaped Desk with other Series C products. 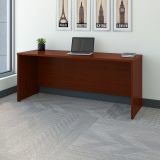 This Office Desk also accepts a coordinating Hutch, Pedestals, Keyboard Trays and a Pencil Drawer (all sold separately) to bring added convenience to your workspace. 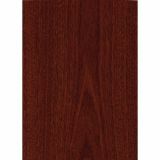 A thermally fused laminate finish, rugged edge banding and thick end panels resist damage to ensure a long-lasting professional appearance. 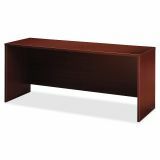 Clean lines and extended modesty panels make a strong impression, while adjustable levelers compensate for uneven floors. Series C offers endless layout options and 7 finishes. Backed by a 10 Year Warranty. American made with U.S. and imported parts. 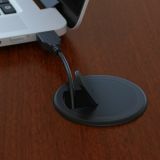 Attaches to desks on right or left with one full-depth end panel and one narrow support panel included. Freestanding when two full-depth panels are installed. 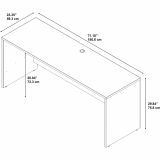 Accepts Pencil Drawer or Keyboard Trays in center, right or left positions. Accommodates 2-Drawer or 3-Drawer Pedestals.